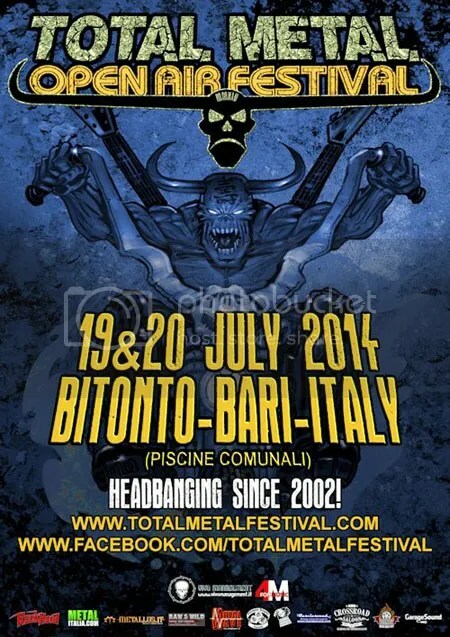 Total Metal Open Air Festival, the “most beautiful metal happening in southern Italy”, has doubled its act. This year’s edition had to be cancelled when the main band pulled off on a very short notice, so in order to compensate it, the organization has managed to turn the previously 12-hour fest into a 2-day party. The event will take place on July 19th and 20th, in the municipal pool area of Bitonto (Bari province). A campsite with toilets and showers will be set up in the area of the festival. After this year’s bad experience, the promoters in Vivo Management won’t announce any names before the bands have signed a written confirmation. Moonspell, Coldsteel and Riul Doamnei were the first to do so. This entry was posted on 19th October 2013 at 4:40 pm and is filed under News with tags Coldsteel, Moonspell, Riul Doamnei, Total Metal Fest, Total Metal Open Air Festival, Vivo Management. You can follow any responses to this entry through the RSS 2.0 feed. You can leave a response, or trackback from your own site.